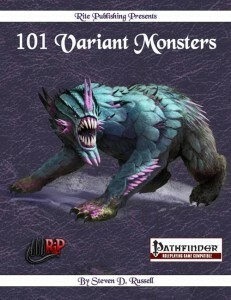 101 Variant Monsters is an epic fantasy supplement for the Pathfinder Roleplaying Game, written by Steven D. Russell and published by Rite Publishing. One of the latest installment of the 101 series from Rite Publishing is an odd combination of elation and disappointment. Elation because who doesn’t love 101 variations on monsters. 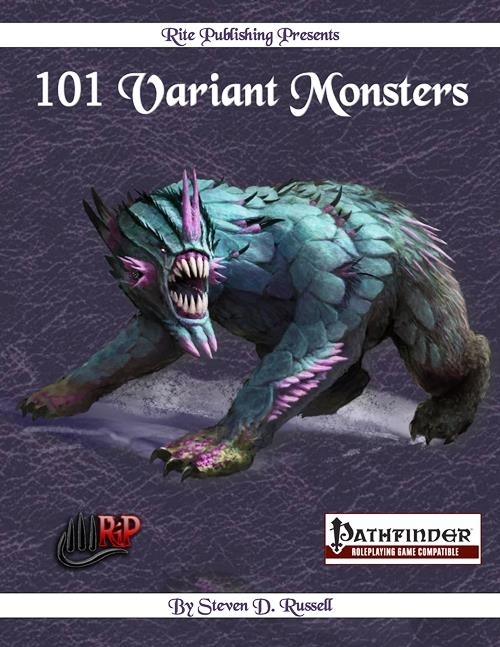 Disappointment because technically there are 101 variant monsters, however, wisely using economy of effort Rite Publishing has re-used several of the variant abilities these monsters have (several time throughout the book) making the 101 number seem like much less. Rite Publishing has proven over and over again that they know what they are doing, they have their layouts down pat, generally make good art decisions and their content can stand up to just about any other game company out there. This book takes what I call a small entry approach to these variant monsters. Imagine the typical entry you would find in a bestiary or monster manual; then cut those typical entries down by half or even a quarter. There is quite a bit of information that can be omitted because these are not new creatures, just variations on existing creatures. These creature entries do not include the normal or base creature’s statistics, so this book must be used in conjunction with the regular Bestiaries. I am a much bigger fan of products like this when they can stand alone, but the addition of stat blocks would have greatly increased the length and cost of this product. A spread sheet at the end might have answered the mail without adding too many pages. Some of the variants presented in this 101 installment are really interesting. Most of them seem like common sense variants, but if that was the case, why didn’t we think of them before and if we did, why didn’t we publish them for the greater good of the gaming world? Many of these entries give regular monsters unique powers that will help add regional flavor to many games. As a GM, even if you do not use the monsters presented in 101 Variant Monsters as written, there is still a ton of good idea material here. The only major drawback is the use of several abilities with just slightly different wording, I counted the same ability used 3 times in the CR 1 creatures alone. I will concede that all three of the creatures are fairy types, but there was not enough of a variation in each entry to let it slide based on their similar types. This product covers variant monsters from CR 1 to CR 25. That is a wide range and the amount of monsters per CR is really easy for a GM to manage. A table of contents listing the pages that each CR can be found in would be a big GM helper during game play. I love that rather than alphabetizing the entries, Rite Publishing chose to list by CR. When running and preparing a game, having entries arranged in this manor keeps things moving quickly and in the Rite direction.